Growing up in my house we always looked forward to Sunday dinner. My mom was a good cook and she always made yummy meals, but Sunday dinner was always a little more special than the other days of the week. That's when we ate things like pot roast, lasagna, roasted chicken etc... There was just something really fulfilling about coming home from church to a perfect wonderful dinner. I've found through the years however, that not everyone has a big Sunday dinner. I've met several people who've said that their moms didn't cook on Sunday. Sunday was left-over day, or a free for all find it yourself make it yourself kind of day. I just don't think I could live like that. I served a mission for my church and when we didn't have a dinner invitation for Sunday, I was so sad. For me Sunday just wasn't Sunday with out a yummy dinner. I'd be interested to know what you think. Should Sunday dinner be special or minimal? Just curious. This was our Sunday dinner today! 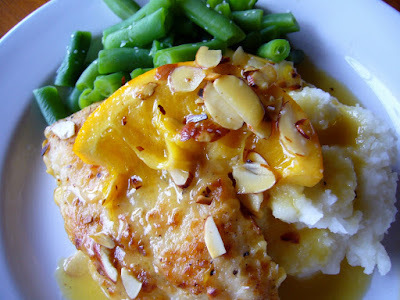 Orange Chicken Piccata served with mashed potatoes and green beans. And it was YUMMY! 1. Cut each breast in half lengthwise. Cover with plastic wrap and pound to ¼ inch thickness. Remove plastic and season with salt and pepper. 2. Dredge chicken in flour. Saute cutlets in oil in a large sauté pan over medium-high heat for 4-5 minutes, or until golden brown. Flip and sauté for 2 more minutes. 3. Remove cutlets from pan and keep warm. 4. Deglaze pan with juice, wine, and mustard. Simmer until reduced by half, about 5 minutes. Reduce heat to low. 5. Whisk in butter until melted. 6. Add orange slices and return chicken to the pan. Cover and simmer for another 5 minutes or until chicken is done. *Nuts should be toasted in a small pan on the stove. Warm the pan over medium-high heat, add the nuts, and toss or stir frequently to ensure they toast uniformly. Nuts taste quickly, (about 5-7 minutes) so keep an eye on them. Control the heat, and keep them moving so they don't burn. The main sign of doneness isn't appearance, it's smell. Properly toasted nuts are very aromatic. Hey! I saw your post in the Utah Hive and thought I would come check you out. I must say... I LOVE YOUR BLOG! Also, your favorite restaurant, Cucina Toscana - my brother works there! :-D He is their accountant and the owner is a good friend of my dad's.